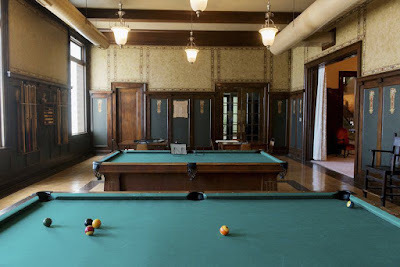 The billiards room at the Joplin Valley of the SR. Photo by Roger Noman. It's a happy headline to read these days. 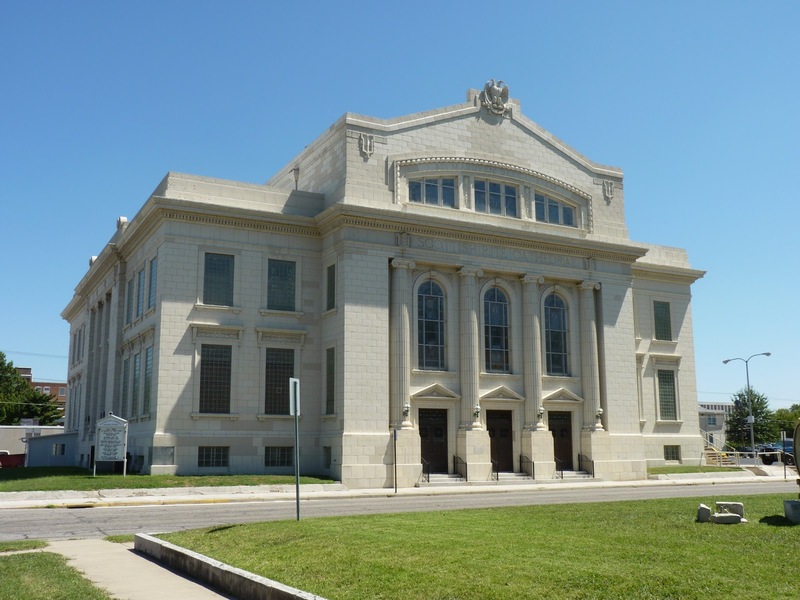 The members of the Scottish Rite in Joplin, Missouri have carefully tended their magnificent building over the last few decades, and have restored it to its original beauty. There was just one room left that hadn't been touched. Reporter Debbie Woodin in the Joplin Globe on Saturday wrote a very long and detailed account of the Rite's finishing touches on its billiard room. 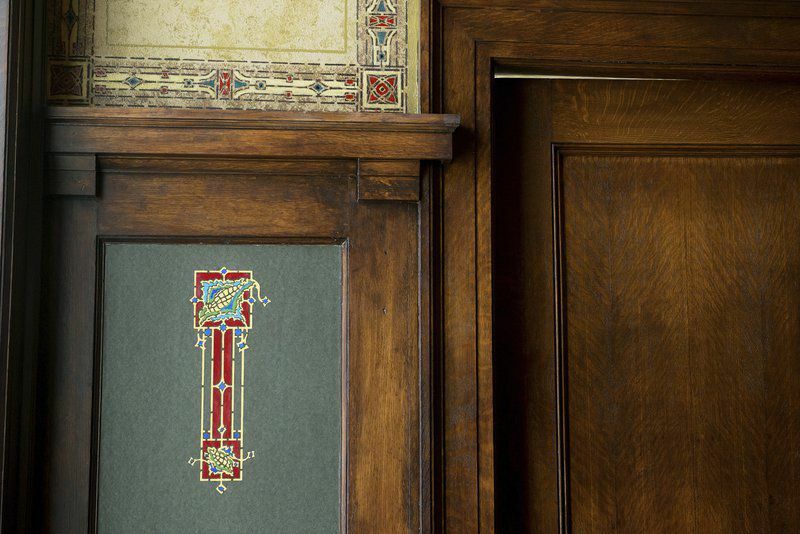 Considered by local historians as one of Joplin's architectural jewels, the Scottish Rite Cathedral has put the shine back on the last room that needed renovation to return the interior of the historic building to its original look of the 1920s. There were myriad versions of pool and billiard games in its heyday as a gentleman's pursuit, and "we have some balls and other equipment for these tables that no one alive knows how to play anymore," said Scottish Rite member Chris Nickle. 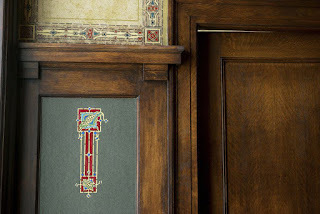 Jeff Neal of The Neal Group, contractor for the project, said he and his workers stripped away the grime of generations of activity and garish past redecorating jobs to find the room appointed wood panels inset with wallpaper and hand-painted stencil work. "The woodwork is 100-year-old English oak that has this beautiful grain in it, and it looked like the pine you'd buy today because it was painted over with peach latex," Neal said. "We were able to use a restoration stripper on it that took the latex paint off. In some areas we were able to get it to a point where we had it back to the original color and then we applied an evening stain on it, and then we just came back with a coat a polyurethane on it, and it came out really nice." The wall's insets between the oak panels had been covered over with wallpaper and later paint. A low, drop ceiling had been installed that was discolored with tobacco smoke. "Basically the rest of the building had been cleaned or restored; it's just nobody had gotten to this one yet," said Nickle of the billiard room. "So everything that was in here was kind of a cheap remodel circa 1960." That paid off by uncovering a number of architectural features. "We took down the drop ceilings and there were wood beams (on the original ceiling)," Neal said. The beams and the ceilings were dirty, but once cleaned and with a few repairs, raised the room to a new height. Some pieces of the original oak wall trim had been removed over the years for alterations. Neal used salvaged wood from hidden spaces such as a utility closet that had to be stripped of paint, but were refinished to complete the room's original dimensions. "Really the only thing different in this room from 1923 to today is the modern duct work and the light fixtures," Nickle said. The room's original light fixtures were missing, but Neal replaced them with some pendant chandeliers that resemble the style used elsewhere in the building. Neal had old photos of the room to use as reference for the restoration project. His work took about two months. When they pulled the wallpaper off the insets between the wood trim, images of the original stencils were imprinted on the back on the wallpaper. "That's how we were able to come up with the image" that gave an artist hired by Neal the detail to paint new wall stencils. Stencil detail. Photo by Roger Noman. Brenda Sageng, a local artist, reproduced the stencils. "She was here for five months painting," said Nickle, "and she recreated those stencils by hand. And they are absolutely 100 percent copies of the originals that were here." Pieces of the old wallpaper with the reverse image of the original stencils were saved. Stenciled medallions in the insets feature an ear of corn, which is a Masonic symbolic for nutrition, said Richard Lowery, executive secretary of the Valley of Joplin Scottish Rite. "This room was intended for refreshment, which could mean food, could mean drink," Lowery said. 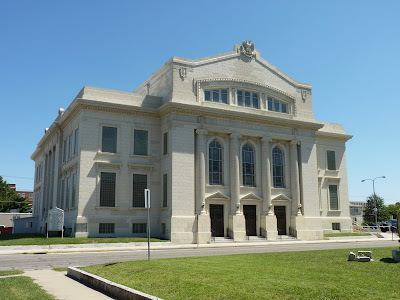 It is a beaux-arts style building noted for, among other things, its original second-story theater and stage furnished with more than 100 hand-painted and original backdrops and curtains, and a pipe organ with 21,000 pipes. Most of the building was cleaned thoroughly or restored in the 1980s and 1990s. "They found a stained glass ceiling upstairs that nobody knew was here until they cleaned the dirt off of it," said Nickle. "They found all kinds of details in this building after they cleaned all the dirt and smoke and soot off these walls." This latest project, restoration of the billiard room, cost $45,000. The money was raised from donations by Masonic members. "The challenge of maintaining this 1920 showcase in the state in which the Scottish Rite has is a real tribute to the Scottish Rite members," said Neal. "It's a huge daily labor, and they cover part of that cost by allowing others to come and use it as an events center for weddings, awards ceremonies and trade shows and other things." The article is much longer. Read the whole piece HERE. BTW, it's not in the article because everybody in Joplin drives past it all the time, but here's a photo of the exterior.